Altavilla, Carlos; Garofalo, Antonio; Vinci, Concetto Paolo, Evaluating the effects of working hours on employment and wages, in: Journal of Policy Modelling 27 (2005) 647-644. Berniell und Bietenbeck (2017): The effect of working hours on health. IZA Discussion Paper No. 10524. Bosch, Gerhard; Lehndorff, Steffen, Working-time reduction and employment: experiences in Europe and economic policy recommendations, in: Cambridge Journal of Eocnomics 25 (2001) 209-243. Brunello, Giorgio, The Employment Effects of Shorter Working Hours: An Application to Japanese Data, in: Economica 224/56 (1989) 473-386. Bunel, Mathieu, Aides incitatives et determinants des embauches des etablissements passes a 35 heures, in: Economie et Statistique 376-377 (2004). Calmfors, Lars; Hoel, Michael, Work Sharing, Employment and Shiftwork, in: Oxford Economic Papers, New Series 4/41 (1989) 758-773. Cette, Gilbert; Chang, Samuel; Konte, Maty, The decreasing returns on working time: An empirical analysis on panel country data. Banque de France Working Papers 351 (2011). Crepon, Bruno; Leclair, Marie; Roux Sebastien, RTT, productivite et employ: nouvelles estimations sur donnees d’enterprises, in: Economie et Statistique 1/376 (2005) 55-89. Crepon, Bruno; Kramarz, Francis, Employed 40 Hours or Not-Employed 39: Lessons from the 1982 Mandatory Reduction of the Workweek, IZA Discussion Paper 416 (2002). De Regt, Erik Ronald, Employment, wages and working time, Doctoral Dissertation (2002) Maastricht University. Estevao, Marcello; Sa, Filipa, Are the French Happy with the 35-Hour Workweek? IZA Discussion Paper 2459 (2006). FitzRoy, Felix R.; Funke, Michael; Nolan, Michael A., Working Time, Taxation and unemployment in general equilibriuwm, in: European Journal of Political Economy 18(2002), 333-344. Franz, Wolfgang; König, Heinz, The Nature and Causes of Unemployment in the Federal Republic of Germany since the 1970s: An Empirical Investigation, in: Economica 210/53 (1986) 219-244. Franz, Wolfgang; Smolny, Werner, Sectoral Wage and Price Formation and Working Time in Germany: An econometric Analysis, in: Zeitschrift für Wirtschafts- und Sozialwissenschaften 4/114 (1994) 507-529. Gubian, Alain, Les 35 heures et l’emploi: d’une loi Aubry a l’autre, in: Regards sur l’actualite no 259 (2000) 3-26. Green, Francis, It’s Been a Hard Day’s Night: The concentration and Intensification of Work in Late Twentieth-Century Britain, in: British Journal of Industrial Relations 1/39 (2001) 53-80. Hart, Robert, Working Time and Employment (Boston 1987). Holman, Corey; Joyeux, Bobbie; Kask, Christopher, Labor productivity trends since 2000, by sector and industry, in: Monthly Labour Review 131 (2008). Huang, Chun-chieh; Chang, Juin-jen; Lai, Ching-Chong; Lin, Chung-chen, Worker Productivity, Working Time Reduction, And The Short-Run And Long-Run Employment Effects, in: Scottish Journal of Political Economy 4/49 (2002) 357-368. Hubermann, Michael; Minns, Chris, The times they are not changing: Days and hours of work in Old and New Worlds, 1870-2000, in: Explorations in Economic History 44 (2007) 538-567. Hunt, Jennifer, The response of wages and actual hours worked to the reductions of standard hours, in: NBER Working Paper Series (1995). Hunt, Jennifer, Has work-sharing worked in Germany?, in: Quarterly Journal of Economics 1/114 (1999) 339-381. Kapteyn, Arie; Kalwij, Adriaan; Zaidi, Asghar, The myth of work-sharing, in: Labour Eocnomics 11/1011 (2004) 293-313. Kawaguchi, Daiji; Naitō, Hisahiro; Yokoyama, Izumi, Labor Market Responses to Legal Work Hour Reduction: Evidence from Japan, Economic and Social Research Institute, Cabinet Office (2008). Kramarz, Francis; Cahuc, Pierre; Crépon, Bruno; Schank, Thorsten; Skans, Oskar Nordström; van Lomuval, Gijsbert; Zylberg, Andre, Labour market effects of work-sharing arrangements in Europe, in: Boeri, Tito; Burda, Michael; Kramarz, Francis (Hrsg. ), Working hours and job sharing in the EU and USA: Are Europeans lazy? Or Americans crazy? (Oxford 2008). Lee, Timothy B., The big puzzle in economics today: why is the economy growing so slowly? In: Vox (2016), Url: http://www.vox.com/2016/8/1/12131216/theories-gdp-growth-slow. Lehment, Harmen, Lohnzurückhaltung, Arbeitszeitverkürzung und Beschäftigung. Eine empirische Untersuchung für die Bundesrepublik Deutschland 1973-2000, in: Die Weltwirtschaft 2 (1991) 72-85. Logeay, Camille; Schreiber, Sven, Testing the effectiveness of the French work-sharing reform: a forecasting approach, in: Applied Economics 17/38 (2006) 2053-2068. Marimon, Ramon; Zilibotti, Fabrizio, Employment and distributional effects of restricting working time, in: European Economic Review 44 (2000) 1291-1326. Martin-Roman, Angel, Working Time Reductions and Labour Force Participation in Unemployment Contexts: A Note, in: Theoretical Economics Letters 4 (2014) 174-182. Moselle, Boaz, Efficiency Wages and the Hours/Unemployment Trade-Off, Discussion Paper 1153 (1996). 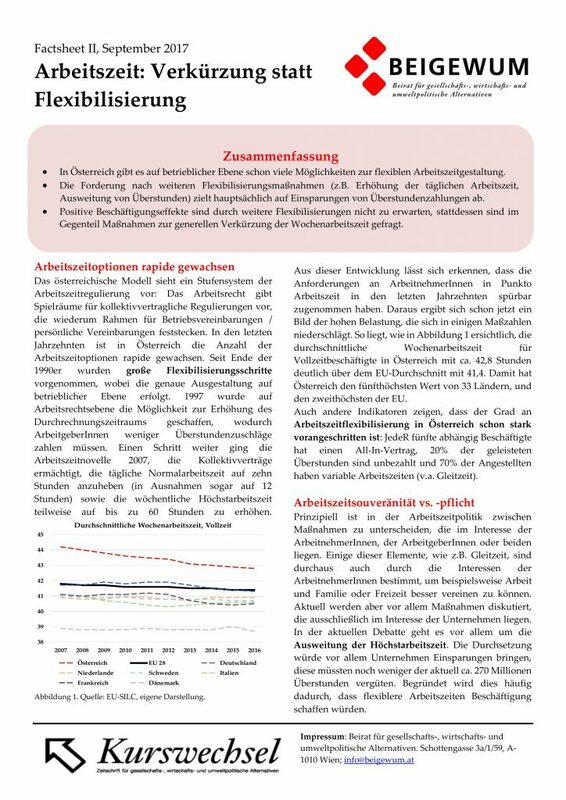 Nachreiner, Rädiker, Janßen, Schomann (2005): Untersuchungen zum Zusammenhang zwischen der Dauer der Arbeitszeit und gesundheitlichen Beeinträchtigungen. Gesellschaft für Arbeits-, Wirtschafts- und Organisationspsychologische Forschung. Oliveira, Aline; Ulrich, Valerie, L’incidence des 35 heures sur le temps partiel, in: Premieres syntheses 1/07 (2002). Passeron, Vladimir, 35 heures: trois ans de mise en oevre du dispositive ‚Aubry I‘, in: Premieres syntheses 2/06 (2002). Pirklbauer (2017): Kinderbetreuung und der 12-Stunden-Tag – Eine Kontroverse. Poyntner, Philipp, Beschäftigungseffekte von Arbeitszeitverkürzung. Eine makroökonomische Perspektive. Wirtschaft und Gesellschaft 4 /2016 (2016). Poyntner, Philipp, The macroeconomic effects of work-sharing. Magisterarbeit, Universität Wien (2015). Raposo, Pedro S.; van Ours, Jan C., How working time reduction affects jobs and wages, in: Economics letters 1/106 (2010) 61-63. Rocheteau, Guillaume, Working time regulation in a search economy with worker moral hazard, in: Journal of Public Economics 3/84 (2002) 387-425. Sanchez, Rafael, Do reductions of standard hours affect employment transitions? Evidence from Chile. Warwick Economic Research Papers 925 (2010). Shepard, Edward; Clifton, Thomas, Are longer hours reducing productivity in manufacturing), in: International Journal of Manpower 7/21 (2000) 540-553. Schank, Thorsten, Have Employees in Germany Received Full Wage Compensation After A Cut In Standard Hours?, in: Manchester School 3/74 (2006) 273-293. Schwendinger, Michael, Über Beschäftigungswirkung und Erfolgsbedingungen von Arbeitszeitverkürzungen. 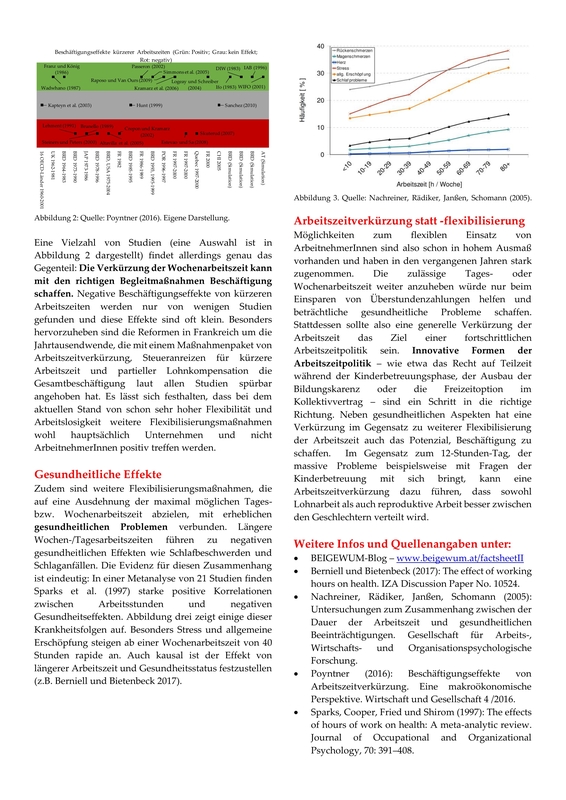 Ein Literaturüberblick, in: Wirtschaft und Gesellschaft 1/41 (2015) 107-126. Simmons, Robert; Schank, Thorsten; Andrews, Martyn, Does Worksharing Work? Some Empirical Evidence from the IAB Panel, in: Discussion Papers, Friedrich-Alexander Universität Erlangen-Nürnberg. 25. Skuterud, Mikal, Identifying the Potential of Work-Sharing as a Job-Creation Strategy, in: Journal of Labour Economics 2/25 (2007) 265-287. Steiner, Viktor; Peters, Rals-Henning, Employment Effects of Work Sharing. An econometric analysis for West Germany, in: ZEW Discussion Papers 0020 (2002). Sparks, Cooper, Fried und Shirom: The effects of hours of work on health: A meta-analytic review. Journal of Occupational and Organizational Psychology, 70: 391–408 (1997).